No one can deny that social media has had a massive impact on how we interact in our day-to-day lives. Brands, companies, groups, individuals, friends and family are all shouting for our attention in the digital space. As the unofficial webmaster of our lodge, I have alerts setup that let me know whenever someone mentions “Redwood lodge”, “Freemasonry” or “masonic”on various platforms. One of these alerts sent me to a blog of one Alan Ewart. His blog posts centre around music and his travels around in a camper van, but one post jumped out in my inbox. 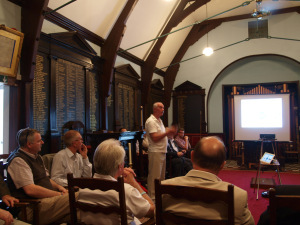 Alan was fortunate enough to attend a meeting of the Masonic “Twitterati” in Devon. Here at Redwood Lodge 3411, we understand the importance of a strong social media presence, (3670 twitter followers YES! ), but other lodges are missing out on this opportunity. Alan gives a good run down of the meeting and the staggering success of North Harrow Lodge 6557. Read Alan’s Blog post here – and let me know your thoughts in the comments section. All feedback and ideas gratefully received.